Bryan Municipal Utilities seeks to provide its customer owners with the best electric service possible, and at the lowest cost consistent with sound economy and good management. In some cases, BMU customer owners may become interested in installing their own emergency backup electric power generation equipment. In these cases, BMU stands ready to work with you to ensure that your generation equipment is installed in a proper and safe manner, and in accordance with all applicable codes, standards, regulations, laws and insurance requirements. In most of these cases, you will also need to coordinate the installation and approval of your emergency backup electric power generator with Bryan Municipal Utilities Electric Superintendent. 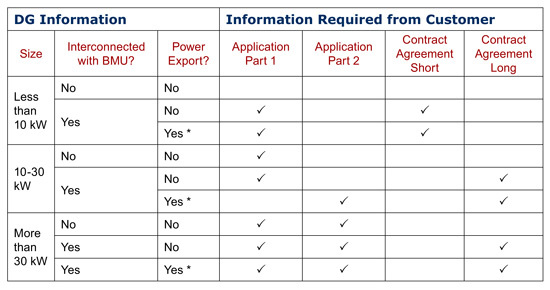 The table below summarizes the information required from a customer who is installing distributed generation. * We do not currently have programs in place for the exporting of power. We are happy to discuss possibilities and explain our limitations.